It has all the right moves, but Tekken 7 is now punching slightly above its weight. What is it: The latest iteration of the classic 3D fighting game, with a few new additions. Multiplayer: 2 player versus, local and online. When it purely comes to fighting, Tekken 7 is glorious fun. Of course it should be, given that its combat model is only a slight refinement of the expansive, immediate and free-flowing set-up perfected some time around Tekken 3 on the PlayStation. But an improved version of a near-perfect thing is nothing to be sniffed at. For the uninitiated, Tekken’s combat focuses on freedom, openness, and breadth of possibility over strict, prescriptive hierarchies of attack and defence. Where other fighting games are dominated by tightly defined rules of risk-and-reward, Tekken—while consummately, thoughtfully precise and balanced—prefers to give you a range of looser options in a more emergent, intricately reactive fighting system. It wants you to try things, just for the hell of it. It wants you to experiment wildly with its vast array of subtly different, malleable attacks, parries, evades and counters. It’s an entirely more organic, sandbox-y fighter than the competition—a fluid, unpredictable and constantly exciting game of incredibly accurate hitboxes and anything-can-happen cause and effect. It’s logical, fair and makes total sense, but it also wants you to know that a ludicrous, woop-inducing turnaround can happen at any given moment. If you're willing to put everything on the line, maybe it will. If Street Fighter is like fisticuffs chess, then Tekken’s faster, more explosive, more intimate and improvisational, laterally-focused game is like Geometry Wars with roundhouse kicks. It's an instinct-driven ‘feel-fighter’ where learning the basics of a character is about exploration over academia. 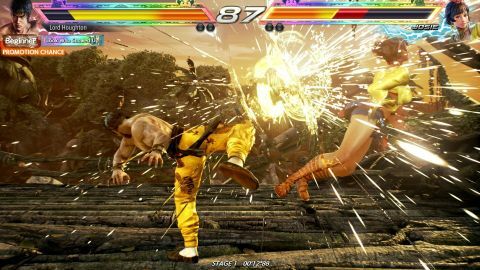 Although largely familiar, Tekken 7 does introduce a cool new system by way of its Rage Arts and Rage Drives. Available once your health bar gets low enough (there's no managing multiple power gauges here, Tekken is much more straightforward than that), Rage will trigger, allowing you to launch one of two powerfully augmented, potentially tide-turning attacks. Arts are big, cinematic super-moves that will often finish your opponent, whereas Drives lean more towards powered up combo-openers. The latter offer less guaranteed damage on hit unless you can follow up, but are much safer from retaliation if blocked. Whichever you go for though, Rage means that every Tekken 7 fight stays exciting right to the very last second. Unfortunately, the game seems to assume that you already know the specifics of how Tekken works, and it really couldn’t care less about teaching you if you don’t. Unfortunately, the game seems to assume that you already know the specifics of how Tekken works, and it really couldn’t care less about teaching you if you don’t. Modern polish aside—and in terms of both action and looks, Tekken 7 is absurdly polished—the singleplayer package wrapped around the jaw-cracking magic is threadbare and annoyingly out-of-touch. While there is a training mode, it makes less effort to educate than a disinterested high school teacher who sticks on a video and catches up on marking until the bell rings. Comprising only the basics of a character-specific moves list and a training dummy that can be programmed with desired behaviours, Tekken 7’s training only really caters to players looking to hone the execution of known strategies. Those wishing to learn the ins and outs of the game’s internal logic and flow are on their own. That the moves-list simply dumps the whole lot—around 80 per character, many of which are indistinguishable in purpose on first, uneducated glance—without any indication of power or functionality, suggesting a lack of overall care. This would be acceptable if Tekken 7 didn’t squander its most promising concession to modern fighting games: the tragically inconsistent story mode. This was almost perfected when NetherRealm introduced the idea in its 2011 Mortal Kombat reboot, showing that a narrative fighting game campaign can deliver a brilliantly creative, character-focused in-road to understanding how to play. There is no mouse support and keyboard controls are terrible, though you'd expect that of a fighting game. Look out for the 57GB install size. The game is locked to 60FPS and runs flawlessly on our GTX970, though adds black bars to ultrawide resolutions. For a full overview of our performance impressions, check out Ian's analysis. Tekken 7, however, seems to understand the basics of this but not the purpose, delivering a short, incoherent and newcomer-hostile tale with a brutally disproportionate ratio of cutscenes to combat. Most maddening is that the final chapters, when it eventually zones in on a purposeful, character-driven story thread and tells it through sustained, increasingly spectacular, multi-stage battles, get it really right, showing off Tekken 7 as a whole with defiant class and flair. As rivalries intensify, the action is seamlessly punctuated with narrative overlays upon decisive hits, with electrifying slow-mo close-ups highlighting key clashes. The story’s late stages feel like the adrenaline-fuelled and cinematic Matrix game we never got. To get there, though, you’ll have to grind through two hours of simplistic, bluntly repetitive battles, as well as earnest yet meaningless chatter with who-the-hell-is-that-anyway characters. On top of that, there's a faceless, morphine-overdose of a narrator apparently aiming for an award-worthy parody of Bad Anime Acting. 30 separate, single-fight ‘Character Episodes’ pad things out with a great deal more, much-needed personality, but damn if that doesn’t just flag more wasted potential. It’s unlikely you’ll even learn anything by accident, too. The story mode’s bizarre decision to furnish one-button macros for key special moves more than sees to that.